I’ve been on a search for recipes that I can feed my husband and I as well as my toothless one-year-old son Cooper. Because Cooper loves sweet potatoes, and because all of the ingredients inside this “taco” are soft, I decided to give it a try even though it seemed a little bit of a random mix of things. Oh my goodness I was in for a shock. It was SOOO good!! It was pretty simple to make and was bursting with flavor! And did I mention full of healthy vegetables?? Personally I think anything with honey, cilantro, and lime is going to be good but add in the sweet potatoes (weird I know) and it is magic in your mouth! I’m going to post the recipe here for your convenience but I got it from Cooking Classy and didn’t change a thing! They have a lot of other awesome recipes so be sure to check them out! 1. Preheat oven to 425 degrees. Line a baking sheet with foil then place sweet potatoes on foil. 2. Drizzle with 3 Tbsp olive oil and toss to evenly coat. 3. Sprinkle evenly with cumin, paprika, coriander, cayenne pepper and season lightly with salt and pepper to taste then toss to evenly coat. 4. Bake in preheated oven 15 – 20 minutes until tender, removing from oven and tossing once halfway through baking. 5. Meanwhile, in a large skillet, heat remaining 1 Tbsp olive oil over medium-high heat. 6. Once hot add onion and saute until caramelized (golden brown on edges and tender), about 5 – 6 minutes, adding in garlic during last 30 seconds of sauteing. 7. Reduce heat to medium-low, add in drained black beans, corn, honey and lime juice. 8. Heat until warmed through. Toss in roasted sweet potatoes and cilantro. 10. Serve over warm tortillas with desired toppings. Want more? Try out these other delicious Taco recipes!! Don't you love when something turns out to be so much better than you think it's going to be?! Haha yes it is the best!! Thanks for stopping by Modelsavings.com I look forward to being apart of one your blog parties as well. Absolutely Yum! I can hardly wait to try this it sounds fantastic – Stop by Garden Up green tomorrow because I'm featuring this at Tuesday's with a Twist. I'm always looking for new ways to use sweet potatoes. They are so good for you! 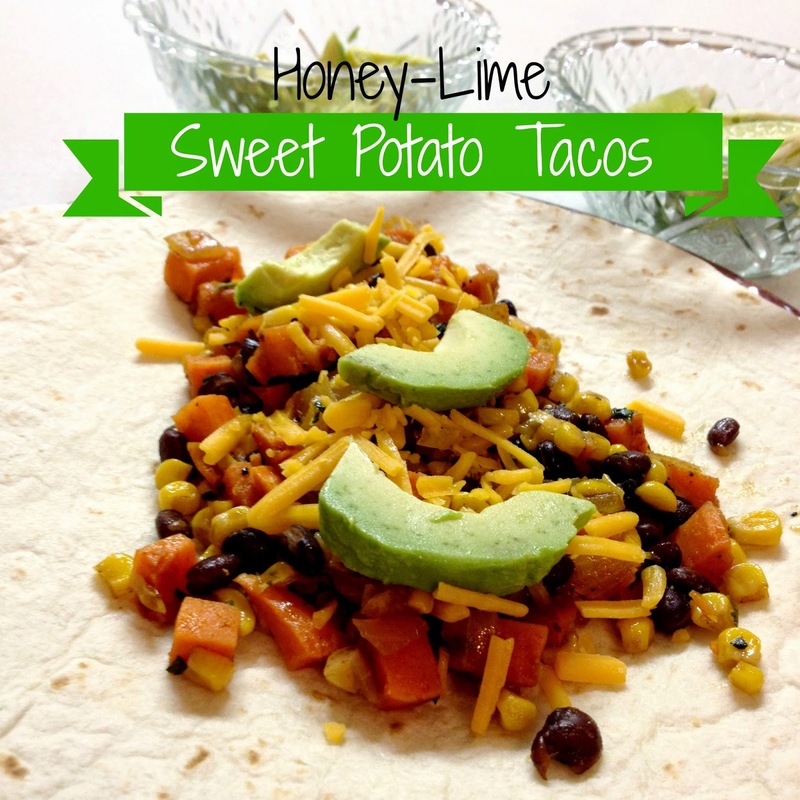 Your Honey -Lime Sweet Potato Tacos look really fresh and delicious. Pinning 🙂 Thank you for sharing with us at the Hearth and Soul hop.